Manufacturers have a tendency to come and go in F1 with remarkable frequency, appearing in a blaze of optimism and budget, only to disappear just as rapidly, usually when the board, no racing passion there, decides that the F1 programme can no longer be 'justified'. Alfa Romeo have a typically sporadic presence in F1's history, though unlike many manufacturers they do have a famous legacy in the sport, having claimed the first two drivers' world championships, for Nino Farina in 1950 and for Juan Manual Fangio in 1951. However, in 1951 the Alfas were increasingly challenged by the burgeoning Scuderia Ferrari concern. Alfa concluded that it would require major investment to meet this, by replacing their long in the tooth 158 model (designed in the 1930s! ), so they quit while they were ahead and withdrew from the sport. Broadly, that's the way it stayed for Alfa for the next quarter century. Despite the odd appearance in F1 as an engine supplier, for McLaren in 1970 and March in 1971, the Alfa name remained as a revered and successful one from the sport's early days. 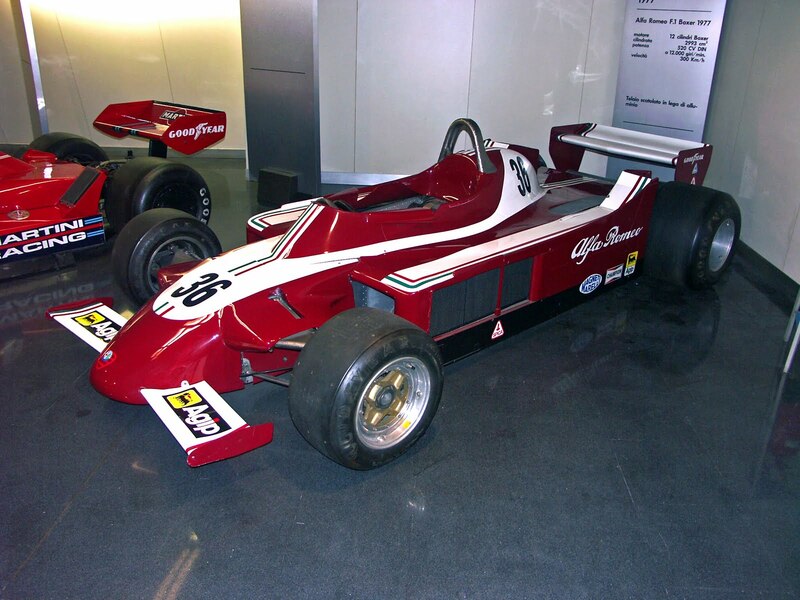 Alfa Romeo did however have a second effort at a factory F1 team, between 1979 and 1985, which was altogether less successful than their first. Things stepped up a gear when Alfa supplied flat-12 engines to the Brabham team from 1976, perhaps inspired by the success of rival firm Ferrari at the time. It was all managed by satellite company Autodelta, who handled Alfa's motor sport endeavours and were led by the colourful engineer Carlo Chiti. The relationship with Brabham though close was largely unsuccessful however, even after world champion Niki Lauda was recruited as driver from 1978. While the engine had power, probably greater than the de rigueur Cosworths of the time, it was incredibly heavy, fuel-thirsty, untidy and complex. For example, the whole engine had to be removed from the car just to change the spark plugs! A V12 engine was hastily produced for 1979, primarily because it was more suited to accommodating the essential ground effect aerodynamics of the time, but if anything it was even bigger on the problems listed above. Despite, or possibly because of, these problems, Carlo Chiti convinced the Alfa Romeo Board to sanction a factory F1 programme (Alfa were in financial problems at the time so Chiti must have been extremely persuasive! ), again managed by Autodelta. 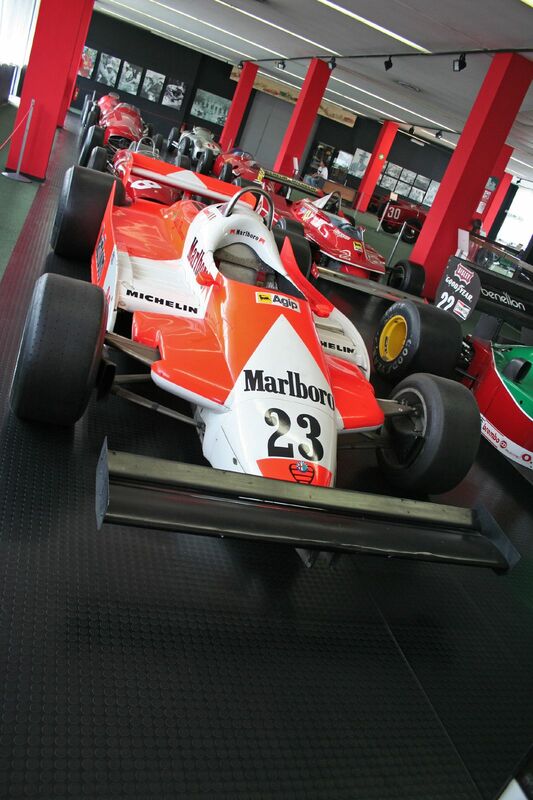 The decision was taken early in 1978, with the plan being to develop the car throughout 1979 and to race proper in 1980. However, the prospect of Alfa's return, given their patchy recent record in supplying engines, in Alan Henry's words: 'raised more than a titter of mirth'. Nevertheless, extensive testing had taken place throughout 1978 at Alfa's test track at Balocco, most of the driving done by the experienced but rather wild former March pilot Vittorio Brambilla. And in the 1979 Belgian race at Zolder a works Alfa Romeo entered a Grand Prix for the first time since 1951, driven by reigning European Formula Two champion (as well as former British F3 champion, and sometime McLaren F1 driver) Bruno Giacomelli. The 177 model was rather bulbous and odd-looking, and was powered by the old flat-12 engine unit rather than the latest V12, but Giacomelli surprised everyone by qualifying mid-grid, ahead of both turbocharged Renaults. He was running well in the race as well until Elio de Angelis's Shadow ran into the back of him, putting both out. Giacomelli and the 177 reappeared in Dijon for the French Grand Prix, before the Alfa team showed they meant business when the new 179 design appeared at Monza for the 1979 Italian Grand Prix. 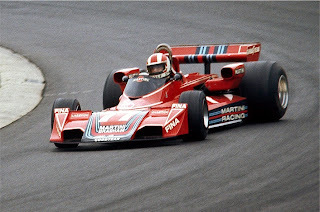 It featured the V12 engine and a full ground effect chassis, and Giacomelli ran strongly in the race, moving up to seventh place by lap 15, and hounding Lauda's Brabham ahead of him, though he then got over-excited on lap 28 and spun out at the Ascari chicane (Brambilla also took part in the race, though in the old 177, his first race back from severe head injuries sustained in the previous year's Italian round). Eyebrows were raised when established F1 front runner and two-times Grand Prix winner Patrick Depailler signed to drive for Alfa for the 1980 season to partner Giacomelli. This was especially as he was still recovering from smashing his legs in a hand gliding accident the previous year, though given he'd been fighting for the championship at the time many in the F1 community had dismissed Depailler somewhat as irresponsible and therefore not worth touching. Eyebrows were raised further when Depailler made the early-season prediction that 'I am sure I will win at least one race for Alfa Romeo this year'. The Frenchman was very nearly proved right however. In many ways, 1980 was Alfa's most impressive season of their return to the sport, and Autocourse declared them 'best of the rest' behind the race-winning teams of Williams, Brabham, Ligier and Renault. Depailler enjoyed a close and productive relationship with Chiti, and the car, resplendent in McLaren-style Marlboro livery, made solid progress. After a circumspect first couple of races Depailler then looked like his old quick and aggressive self, and bubbled with enthusiasm out of the cockpit which the team certainly responded to. He announced the team's arrival as a threat by qualifying third at Long Beach, and the Alfas often ran near the front runners. Many solid points finishes were denied by unreliability, most notably in Long Beach and Monaco wherein Depailler would almost certainly have claimed podium finishes but for mechanical gremlins. Tragedy awaited for the fledgling Alfa team mid-season however, when in pre-German Grand Prix testing at Hockenheim Depailler crashed at the then ultra-quick Ostkurve, probably because of suspension failure, and died from his injuries. The team however, and team mate Giacomelli in particular, responded magnificently to this setback and continued to make competitive progress in the second half of the year. Suddenly realising that the team was dependent upon him, Giacomelli seriously stepped up his performances. In the first half of the season his driving had been somewhat lacking in conviction and error strewn, but in the Hockenheim race he finished fifth, climbing through the field magnificently after starting in a lowly grid position. Then for the remainder of the season Giacomelli was consistently fighting with the front running teams, and that he didn't convert this to results was a consequence both of bad luck and driver mistakes. At the next race, in Austria, Giacomelli ran strongly among the pace setting Renaults, Williams and Brabhams, though developed a handling problem, which he thought would be cured by a tyre change, but a wheel, not attached properly in the stop, fell off as he left the pits. Giacomelli was similarly competitive in the Italian Grand Prix, uniquely in 1980 held at Imola rather than Monza, only for a puncture to put him out, caused by running over debris resultant from Villeneuve crashing his Ferrari in front of him. There were other occasions where Giacomelli's inexperience, and impetuosity in battle, told. At the Dutch Grand Prix at Zandvoort Giacomelli was in a fine third place, and pressuring Jacques Laffite's Ligier in second (and the way the Alfa had previously outdragged the turbocharged Renault of Arnoux suggested it wouldn't be long until he passed). But Bruno got his braking wrong and spun at Panoramabocht, and then destroyed his skirts (vital for ground effect downforce) running over a kerb in recovery, which eventually put him out. And in Canada he made a pig's ear of passing Didier Pironi's Ligier for third place, again destroying his skirts on a kerb. Then came the final round of the season, at Watkins Glen in upstate New York. Giacomelli took Alfa's first pole (at least since 1951! ), by a full eight tenths of a second from Piquet's Brabham in second. Come the race Giacomelli blasted into the lead from pole in fine style, calmly rebuffed Piquet's challenge on the first lap and then edged out into a commending lead of upwards of ten seconds, all the while showing a calmness and authority that many didn't think him capable of. Come half distance, the only question was whether new world champion Alan Jones, who had climbed to second place having fallen to 12th after an off at the first corner, could catch, and pass, Giacomelli. Bruno himself was convinced that the answer would be no: 'Engine running well, temperatures under control, tyres perfect...I had 500 rpm in hand. Quickest through the chicane, quick down the straights too'. Sadly, the question became academic almost immediately as on lap 31 of 59 Giacomelli's black box failed, causing his retirement. The surge of disappointment in the Alfa pit, and from Giacomelli himself, was palpable. Nobody knew it yet, but rather than being a point from which the Alfa team would progress, this was the team's high tide water mark. Alfa's failure to fulfil their potential in subsequent years can be attributed to a number of things. Despite much enthusiasm and a healthy budget, internal disorganisation, politicking and in-fighting, which tended to go right to the top with Carlo Chiti in charge, often held the team back. No driver subsequent to Depailler seemed to form as productive a relationship with Chiti and the other engineers or were as capable to give the team direction, and it didn't help that from 1982 onwards they lacked that sort of experienced and assured driver at the wheel. Indeed, in this period their drivers often betrayed a lack of confidence and assurance in their driving which probably reflected everything that was going on around them. And while Chiti was always well known for the speed of turnaround his his engineering solutions, the quality of them was more questionable. Then there were the engines - Alfa never seemed to get any closer to solving the problems that had dogged their power units going right back to the days of supplying the Brabham team - namely their weight, fuel-thirstiness, inconsistency and unreliability. However, their failure to 'kick on' in 1981 was for peculiar reasons to a large extent. Things were looking up for Alfa going into that season, and such was the promise the car had shown in the latter part of 1980 Mario Andretti, the 1978 World Champion, chose to join the team for 1981 rather than pursue an option to potentially join McLaren. The revised 179 flew in pre-season testing, but then FISA rushed through a number of rule changes for the new year, which included a ban on sliding skirts and a 6cm ground clearance. This seemed to catch Alfa on the hop more than other teams, but what really caught them out was that the F1 field came up with wheezes to lower the car to far below the 'minimum' 6cm when out on track, thus taking far more advantage of downforce from their shaped undersides. Chiti, to his credit, refused to flagrantly break the rules in such a way, but it left the team at a major competitive disadvantage. Mario Andretti recently commented that on one occasion in Paul Ricard testing in 1981 they tested with the lower ride height, for the sake of comparison, and they were 'absolutely there' on pace. As it was, they had to make do with appeasing their consciences by being the only legal cars on the track! Andretti took an encouraging fourth place in the opening round, at Long Beach (not coincidentally the one race before car-lowering was practiced in the F1 field), but from then on the Alfas were, in Andretti's words, 'beaten to the ground'. A succession of reliability problems didn't help them either. The team did enjoy a late season upswing, with the arrival of star designer Gerard Ducarouge before the Dutch Grand Prix, recently (and rather unfathomably) fired by Ligier. Ducarouge set to work very rapidly, and at Zandvoort Andrettti commented on the 179 machine: '...the thing's been transformed. New side-pods, differential, front suspension geometry, things like that'. Andretti showed the revised car's potential by qualifying seventh at Zandvoort, but then Giacomelli came alive in the late races of the season, as he had in 1980. For most of 1981 Giacomelli's performances had seemed a world away from his dominant Watkins Glen effort: tentative and riddled with error. But at Monza he moved into third place in fine style and stayed there for many laps, before he was hobbled by a gearbox jamming in fifth. Then, in Montreal Giacomelli took his first points of the season by coming in fourth in the pouring rain. And in the season-ending US Grand Prix, this time in Las Vegas, for the second year in a row Giacomelli could, perhaps should, have claimed race victory. Benefiting from harder-compound Michelins Giacomelli was in fourth place early on only to 'try too hard' and half-spin. By the time he found reverse and recovered Alan Jones's leading Williams was almost far enough ahead to lap him, but Giacomelli got on with it and eventually finished third, only 20 seconds down on race-winner Jones at the end. Andretti, by the end of 1981 exasperated, left the Alfa team to return to CART in the US. 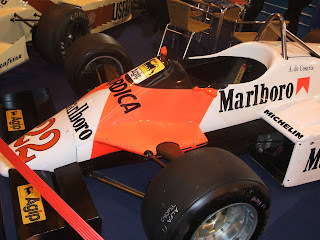 The team were then put in the invidious position of having the sometimes fast but often extremely erratic and accident-prone Andrea de Cesaris thrust into their drivers line-up to partner Giacomelli for 1982 by sponsor Marlboro (apparently Daddy de Cesaris was high up in the tobacco company). The team nevertheless gave their two drivers equal number one status, which impacted somewhat on Giacomelli's often fragile confidence. Alfa's design team, led by Ducarouge, produced a new car, the 182, which looked like it would go places. It was F1's second ever carbon fibre build (after the previous year's McLaren), the team again showing they were quick to react, and was much slimmer, sleeker and lighter than their previous efforts. However, they continued to rely on their increasingly long in the tooth V12 engine, their V8 turbo, in development since 1980, still not ready to race. And Ducarouge's efforts were continually hampered from within. In Nigel Roebuck's words: 'A man called Ducaroni might have succeeded, but Carlo Chiti had no enthusiasm for a Frenchman on his staff, and petty jealousies constantly intruded upon the business of making the car quick'. Ducarouge himself confirms that his relationship with Chiti 'went quickly downhill' and that his whole experience with Alfa was 'a terrible wasted opportunity'. 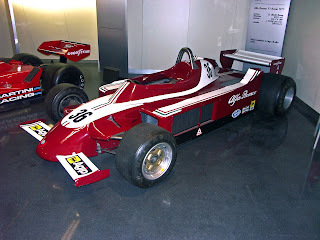 Nevertheless, some good moments were salvaged from Alfa's 1982 season. De Cesaris took his first, and Alfa's second, pole position at the Long Beach round. He also led early on, before ceding his lead to Lauda's McLaren, after missing a gearchange while too busy shaking his fist at a backmarker (if ever an incident summed Andrea up...)! He was nevertheless on for finishing in second only to put his car into the wall, while distracted by the sight of some smoke coming from his rear brake ducts via his mirrors. De Cesaris also drove well at Monaco, close to the pace setters, and would have won the race in some comical closing laps had he not run out of petrol on his last tour (he was classified third). Similarly strong runs in Belgium and Canada did not reap the points they deserved, because of a broken gearbox and, again, lack of fuel, respectively. Elsewhere, perhaps a consequence of frustration at the lack of reliability and behind the scenes shenanigans, de Cesaris's driving developed a desperate and increasingly egregious edge and Giacomelli seemed more and more ineffective. By the end of the 1982 season Autodelta, still running the team on Alfa's behalf, were in financial bother, and rumours abounded that the Alfa team were to quit the sport. However, Paolo Pavanello's Euroracing squad, new to F1 but with F3 experience, took over the running of the team. On the face of it, this didn't change much as key staff such as Chiti and Ducarouge were retained, as was Marlboro sponsorship, though at Euroracing's behest former F3 Euroracing driver Mauro Baldi was brought in to replace Giacomelli. However, behind the scenes the change added to Ducarouge's exasperation, as having spent much of 1982 working on the team's technical infrastructure he found himself having to start from base camp effectively with the Euroracing switch. His relationship with Pavanello was also barely better than that with Chiti, but in this case it was down to a difference in priorities: 'We were not on the same wavelength, I asked him to invest money in testing, in development and in wind tunnel testing. He wanted to make cut-backs'. Ducarouge's misery was almost over though. At the early season 1983 French Grand Prix at Paul Ricard de Cesaris recorded the fastest time in the first qualifying session, only for the times to be scrubbed after it was found in scrutineering that its fire extinguisher was empty (rumours abounded that the FIA were tipped off by a disgruntled member of the Alfa team...). Ducarouge, post-race, was forced to carry the can and was fired by his team. In amongst all of this the Alfa team somehow managed to have its best ever season points wise. The V8 turbo was finally race-ready, like previous Alfa engines it was incredibly fuel-thirsty, though in 1983 in-race refuelling became widespread practice, and could have been invented for the Alfa engine. The car's finishing record was once again terrible, as was the consistency of their engine performance, but the few finishes they did manage included rich points harvests from two second places in Germany and South Africa, as well as fourth place in the 'European GP' at Brands Hatch, each provided by de Cesaris. This contributed to 18 points for the team come the season's end. Some even talked of de Cesaris finding a new maturity. And de Cesaris added another 'win that got away' to Alfa's list, at that season's Belgian race, back at the revised but still spectacular and challenging Spa track. Having qualified third, he took the lead in the run to the first corner and drove immaculately to lead relatively comfortably for the first half of the race. A fumbled pit stop then dropped him about ten seconds behind Alain Prost's Renault, and before we could find out if he could claw that back his engine failed. 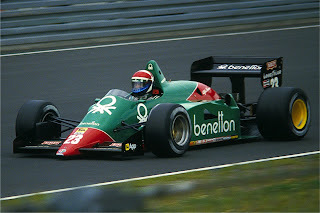 For 1984 there was not only a new look for Alfa, now with green Benetton livery, there was two new rapid and experienced drivers in Riccardo Patrese and Eddie Cheever, and as the car was launched everyone associated with the team seemed optimistic. However, the season was a disaster. Perhaps more than anyone else Alfa were impeded by 1984's new 'fuel rules' - not only was in-race refueling banned but fuel was strictly rationed to 220 litres per car per race. Alfa's V8 turbo remained immensely thirsty, fuel being hurled into the crude unit to cool it. Apparently in the previous year's German Grand Prix in finishing second de Cesaris had used no less than 310 litres of fuel! The conundrum that faced them in 1984 was clear, and races for both Alfas became economy runs in 1984. Furthermore, they lagged behind the top engines such as the BMW and the TAG on power output, and their reliability hadn't improved any. Indeed it seemed worse than ever, and seeing Alfa engines go pop was a regular occurrence. It reached the point that it became part of their rivals' tactics in qualifying to get their quick lap on the board before an unstitched Alfa engine coated the road with oil! One third place (for Patrese at Monza) and two fourths (one for Patrese at Kyalami and one for Cheever at Rio) were the most that could be salvaged from the year. The major engine objective for the 1985 season was to control the V8 unit's thirst for fuel, but the engine remained woefully short of power and reliability, and from 32 starts between them Cheever and Patrese only made it to the finish seven times, and didn't so much as score a point (indeed, ninth place was their highest finish). Not entirely surprisingly, Alfa Romeo announced that they wouldn't be continuing as a constructor into 1986. It's tempting to talk of Alfa's F1 endeavours finishing with a whimper, but the truth is that much of their 'second' stab at F1 was whimper-like. The 18 points accumulated in 1983 was their best return for a single season, and they only claimed a further 32 points in total across their other five and a bit years. Two poles, five podiums and one fastest lap was the most that they could muster overall, astonishing given their name and reputation. The Alfa team's initial promise and enthusiasm rapidly gave way to internal infighting and disorganisation, and there was a constant and curious inability to get on top of problems that had dogged them for years, most notably unreliability and extreme fuel consumption, both of which contributed to their woeful finishing record. All in all, it was hardly in keeping with Alfa's revered legacy in the sport.